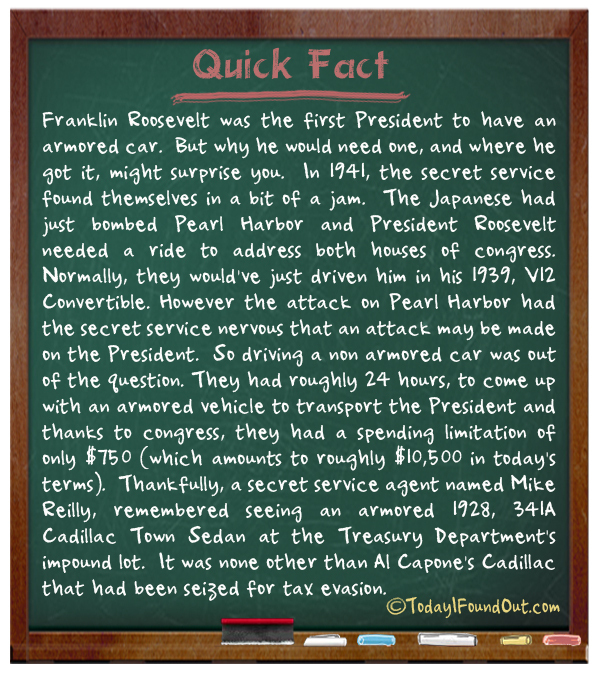 Franklin Roosevelt was the first President to have an armored car. But why he would need one, and where he got it, might surprise you. In 1941, the secret service found themselves in a bit of a jam. The Japanese had just bombed Pearl Harbor and President Roosevelt needed a ride to address both houses of congress. Normally, they would’ve just driven him in his 1939, V12 Convertible. However the attack on Pearl Harbor had the secret service nervous that an attack may be made on the President. So driving a non armored car was out of the question. They had roughly 24 hours, to come up with an armored vehicle to transport the President and thanks to congress, they had a spending limitation of only $750 (which amounts to roughly $10,500 in today’s terms). Thankfully, a secret service agent named Mike Reilly, remembered seeing an armored 1928, 341A Cadillac Town Sedan at the Treasury Department’s impound lot. It was none other than Al Capone’s Cadillac that had been seized for tax evasion.